Set up a general accounting unit. Configure a default general accounting unit. A general accounting unit (GAU) is a fund that you can segregate for specific use or to meet restrictions set by the donor, grant authority, governing agency, or required by law. Nonprofit Success Pack allows you to define as many GAUs as you need to match your chart of accounts. You can then enter and track donations as parts of a GAU — either as a percentage of the donation amount, or as a specific dollar amount. You can also use GAU’s in conjunction with Salesforce campaigns to automatically assign an allocation to the group of donations in a campaign at predetermined percentages or dollar amounts. 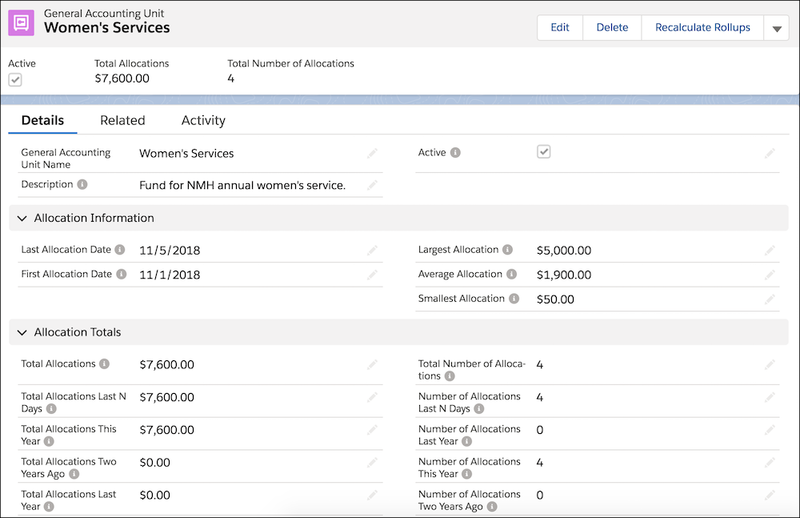 Nonprofit Success Pack’s GAU allocations function gives you the ability to split funds that you record as opportunities between one or more GAUs. You can define allocations as a percentage of the total opportunity or payment, or as a specific currency amount. In NPSP, GAUs contain rollup information for the allocations you’ve assigned to them. You can also assign allocations to campaigns and recurring donations. You’ll need to define at least one GAU before your organization can begin using GAU allocations. You can easily do this on the General Accounting Units tab or by enabling a default GAU on the NPSP Settings tab. This is a good method for adding GAU allocations on an ad hoc basis, but if you already know you want to add a GAU allocation to every opportunity, be sure to read the Enable Default Allocations section. You can create additional GAUs at any time. If you want to transfer donations from one GAU to another, however, you either need to do it manually in each opportunity or do a bulk data update with a data management app. 1. Click the app launcher ( ). 2. From the All Items menu, select General Accounting Units. 3. On the General Accounting Units page, click New. 4. In the General Accounting Unit Name text box, enter the name of the new GAU. And add a description to help your users pick the correct fund when needed. 5. Click Save, or click Save and New if you want to create more GAUs. If you have a long list of GAU’s, you can also import them from a spreadsheet using the Salesforce data import wizard. Once the GAU’s are set up, your users can then allocate donations from the GAU Allocations related list on the opportunity record. If you set up a default allocation, they will see the full amount of the donation already allocated to the default GAU. Users can set up an allocation for recurring donation and campaign records by clicking the Manage Allocations button on the GAU related list for that record. 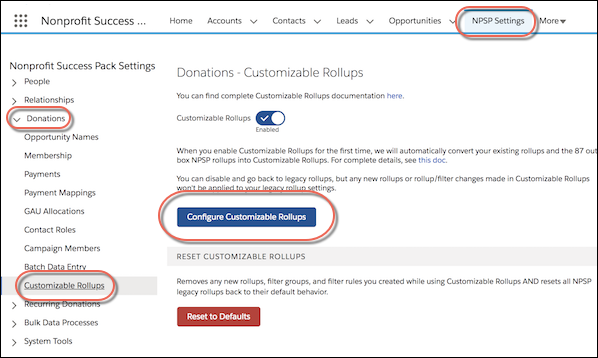 When a user specifies allocations for a recurring donation or campaign, Salesforce automatically allocates the donation accordingly for every open child opportunity created by the recurring donation or assigned to the campaign respectively. You can enable a default GAU if you want Salesforce to allocate all non-excluded donations/opportunities to that GAU upon creation. If you have a specific opportunity that you want to allocate to a different GAU, you can always use the Manage Allocations button to make changes. You do not need to enable a default GAU to use GAU allocations, but if you plan on allocating donations, make sure you set up your GAUs accordingly. A default GAU comes in handy when you want to run reports in Salesforce. For example, if you wanted to report on all of your donations (not just those allocated to particular GAUs), you could run a report that included information about allocated donations, as well as information about donations to the default GAU (often called a “general fund” or "unrestricted"). Nonprofit Success Pack comes with a two standard GAUs, the general fund and the restricted fund. You can select the general fund GAU as your default when you enable default allocations. 2. Click the NPSP Settings tab, click Donations > GAU Allocations. 4. In the Default Allocations Setting area, select the Default Allocations Enabled checkbox. 5. From the Default General Accounting Unit drop-down menu, select the GAU you want to use as your default. 7. (Optional) If you want all current unallocated opportunities to be assigned to your default GAU, in NPSP Settings go to Bulk Data Processes > Batch Create Default Allocations and click Run Batch. Salesforce then runs through all of your opportunities, looks for unallocated amounts, and assigns them to your specified default GAU. GAU allocations comes with a series of rollups that help you track the allocations you assign to your GAUs. You can find these GAU rollups by clicking the General Accounting Unit tab in Salesforce, and then selecting the GAU name. The rollups come with predefined settings that you can update as needed. If you're using customizable rollups, set these values on the rollups themselves. 1. From the NPSP Settings tab, click Donations > Customizable Rollups. 2. Click Configure Customizable Rollups. 3. Click the row for the allocation rollup you want to edit. 5. To set a Rollup N Day Value, select Days Back in the Time Frame field, then enter the number of days back. The key takeaway here is that if your organization wants to use Allocations, you need to set up at least one GAU.